I have been very fortunate to have a long and successful pro-racing career. 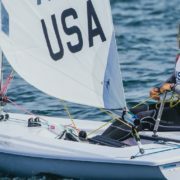 Growing up and sailing in the San Francisco Bay area, one of the most beautiful and challenging bodies of water on our planet, insured that I had to earn my sailing stripes and as a result become very competitive. 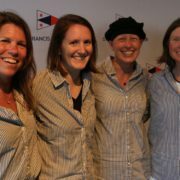 I have been involved in many International teams representing all classes, and at all levels of sailing from Friday night races in the Bay Area to involvement in 3 America’s Cup campaigns, as well as 1 Whitbread and 1 Volvo campaign, winning 6 World Championships, and competing in 8 Admiral’s Cups. My life’s journey was seriously interrupted during the 2007 Valencia America’s Cup when I was diagnosed with Stage 4 Lung Cancer. I have never smoked, so this was shocking news. I was told to travel back to the States to get my affairs in order, as I only had a few more months to live. I could no longer walk, and was forced to accept the level of surgery in Spain that was being offered to me there. 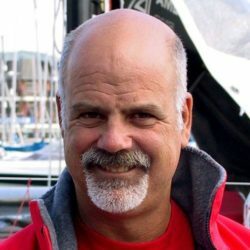 Afterwards, my sailing community rallied around me, and I was eventually transported back home to the USA, where I began an amazing relationship with John’s Hopkins and their Orthopedic Oncology team. I had a will to fight and to live with new experimental drugs. I can proudly say that was 8 years ago. My recovery took me out of my normal sailing arena, and it was 12 months before I could really walk the docks in the hope of racing again. I knew I would never be the 100% that I was before, but I still had the will and mindset to pick up the pieces and try to reboot my career. Luckily, I re-launched my career and I went on to successfully compete and win the Mini Maxi World Championships of 2012. Unfortunately in 2013 during the America’s Cup in San Francisco, my life took another radical turn. I was riding my bicycle to our shore base where I was employed by Emirates Team NZL as their Local Knowledge and Strategy Expert. I was hit by a car, 1/2 a mile away from the gates, on the 3rd to last day of racing. This accident caused me to endure yet another major spine surgery, and by 2014, I was declared disabled. I have never been much for excuses or for being held down. I just like to get on with it. After taking all of 2014 off to recover from that surgery, my desire was back to sail again. Not knowing how much “normal” race work I could do, I approached my friend Grant Spanhake, the Tech Director of the USA Olympic team, to offer my help to the team with tactics and strategy. He told me that it was a good idea, but if I wanted to help the team more, I needed to sail in the Paralympics. Grant, otherwise known as “Fuzz”, convinced me to look into it and so I did. I am proud to say that I was cleared medically in April 2015 to try out for the USA team. I recently flew myself over to Hyeres, France for the OCR regatta, April 15th. I not only cleared the International Medical Criteria by another point, but I successfully competed amongst the world’s leading Paralympic sailors in the 2.4m class. It was clear to me that I could compete at a higher level with more practice and time in the boat on the water. Drawing from my experience of sailing and being a tactician over the last 40 years in International competition, I plan to use this skill set to build a winning program. I have 150 days scheduled to race against the best sailors in the world over the next 18 months. This program will include the purchase of 2 boats, test sails, rigs and various setups to make sure I am fast in all conditions. Racing against the worlds best in major international regattas. The US Olympic and Paralympic Committee have been overwhelmingly supportive in this endeavor. It would give me great pleasure to compete and to represent the USA for a possible shot at a medal.